The Shopify Plus integration allows you to connect your Shopify Plus store to your Cordial account for seamless exporting of customer, product and order data. Once the integration is set up, attributes are mapped, and data is synchronized, you will be able to build audiences, trigger messages and personalize message content based on products, customers and order data from your Shopify account. 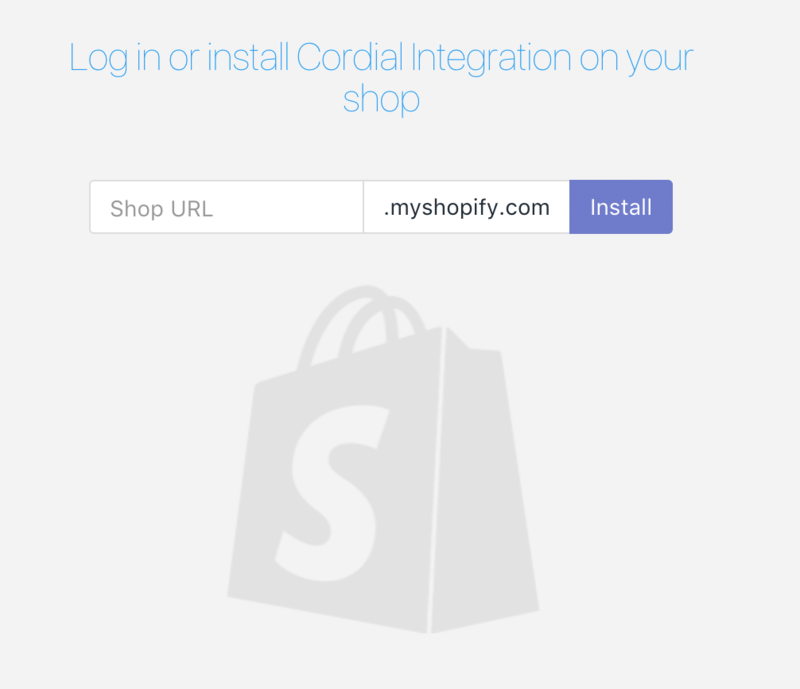 Navigate to https://shopify.cordial.com and enter your Shopify shop URL to install the Cordial app. Give permission to install the app in your account. In your Cordial account, create a new API key for the catch-all IP address 0.0.0.0/0 . Learn how to generate an API key. On the Cordial Administration page in Shopify, enter your API key and click the Test Token Validation button to check the API connection in your Cordial account. Enter your Cordial Account Key. You can find your Account Key on the Account Settings page in the Cordial platform. Choose whether to enable the trigger messages option. If enabled, automated messages in Cordial that are set to send based on an event trigger will be sent when data is synced from Shopify. Learn more about the event triggered sending method. 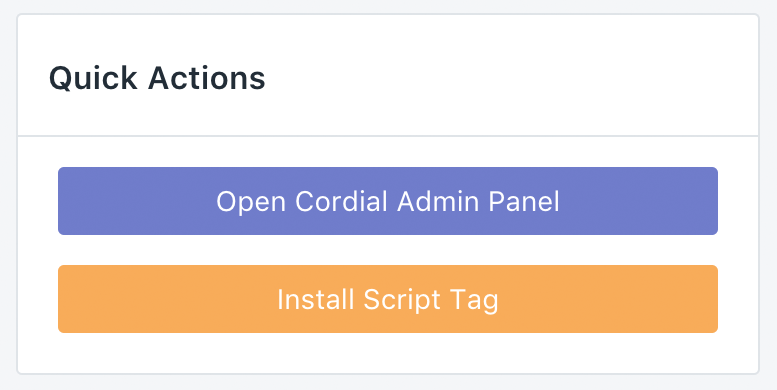 To install the script tag, click on Install Script Tag, in the Quick Actions menu on the Cordial Administration page. Congratulations, your Shopify account is now connected to Cordial! Continue reading below to learn how to map contact attributes and synchronize product, customer and order data. 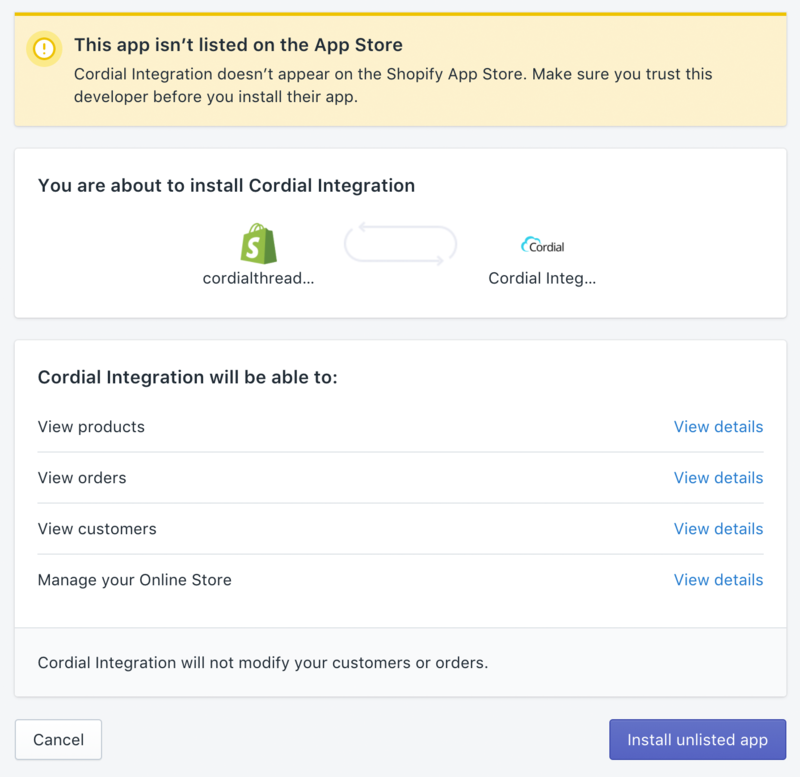 Once the Cordial app is connected to your account, you can start mapping Shopify customer fields to your contact attributes in Cordial. 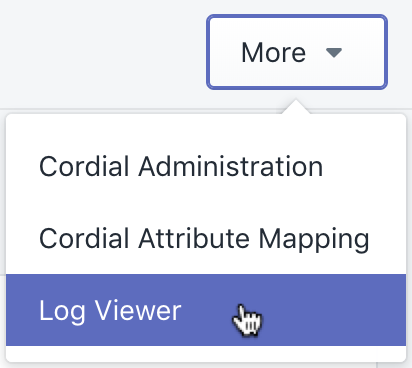 Navigate to the attribute mapping page by clicking on the More dropdown in the top right of the admin and choose Cordial Attribute Mapping. On the Cordial Attribute Mapping page, choose a Customer Field from the drop down menu and click Add. 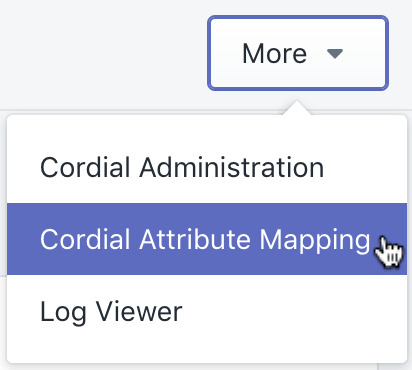 You can choose to create a new Cordial attribute to map to or select an existing attribute in the Cordial Key dropdown. Once all Shopify customer fields are mapped to their corresponding Cordial contact attributes, click Save. Existing contact attributes will then be mapped and any new contact attributes will be added to your Cordial account. When synchronizing data from Shopify to Cordial, there are two options: manual synchronization and automated recurring synchronization. Normally you would use the manual method to make a one-time sync of historic data and then set a recurring schedule for all future automated data posts. Note that these synchronizations all use the API to post data. Note that synchronization is one-way post of contact, product and order data. Data is posted from Shopify to Cordial and not in reverse. For example, if a contact attribute is updated in Cordial (i.e. first name), it will not be updated in Shopify. The synchronization of subscribe status changes depending on the contact's status in Cordial. Note above that if a contact has unsubscribed from receiving promotional emails in Cordial, it is not possible to change the subscribe status to subscribed as a result of a Shopify synchronization. Also, if a contact is subscribed in Cordial, it is not possible to change subscribe status to none as a result of a Shopify synchronization. After mapping attributes to your Cordial account, you should sync all desired historical data from Shopify. This will ensure that your Cordial account is up to date with product, customer and order data from your Shopify account. 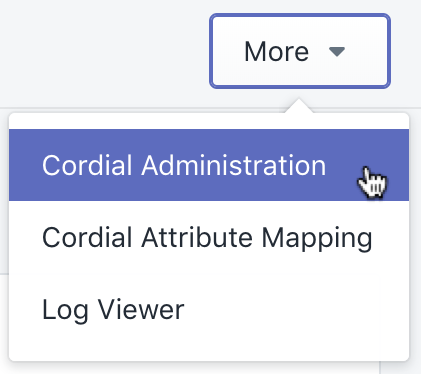 Navigate to the Cordial Admin page from the More menu. On the Cordial Admin page, locate the section titled: Manually Synchronize all records with Cordial. Decide which data you would like to manually post to your Cordial account (products, Customers or Orders), choose a date in the past where you would like importing to start from, and click the Start button. All new and updated data recorded after the specified Since date will be posted to Cordial. Once you have manually synchronized your data, you can then set a recurring interval to automatically synchronize any new and updated data moving forward. In the Automatically Synchronize with Cordial section, enter the interval in minutes (3 minute minimum) and click Enable for each data collection. You will then see the Next Run Time displayed. Note: Any past historic data will not be synchronized to Cordial. Only new and updated data since the the last interval synchronization will be posted. If data is not posting to your Cordial account, there may be some API errors. You can view the last 100 errors on the API Log page. Navigate to the Log page where you will see any API errors that were generated. Congratulations! Your Shopify account is now configured and synchronized with your Cordial account. You'll now be able to build audiences and trigger messages based on data collected from your Shopify store.